It has been found that for some people when they export their Quicken Mac 2007 data in QIF form, for importing into Quicken Windows, Quicken Windows will put up an error saying "Bad file format". This is caused by some of the QIF transactions having non printable characters in them. The result will Quicken Windows will only import the transactions up to that point and stop. 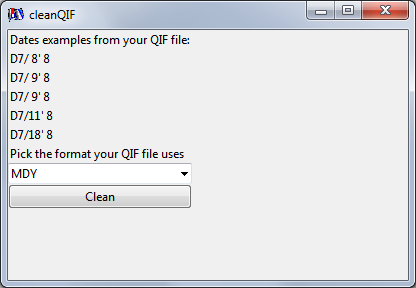 CleanQIF was created to remove any non printable characters from a QIF, which should allow it to be imported into Quicken Windows. It also changes the end of line character(s) so that it is easier to read the QIF file in a Windows editor. CleanQIF should run under any version of Windows. ADDED: Several people have reported not being able to get Quicken for the Mac to put out the dates in the proper format, that is to put out the year in 4 digits so that 01 is not treated as 1901. CleanQIF which was intended for cleaning up the garbage characters that can be in a Quicken Mac QIF file will now allow you to reformat the date too. It will change all dates to have 4 digit years, and it will even change the month, day, year around if needed (as directed by the user). To use CleanQIF download it from here to some place like your desktop. After you have done that drag the QIF file to be cleaned on top of cleanQIF.exe. It will run and create a new QIF file the non printable characters removed. It will not change the original QIF file. Please note that if you are using non printable character for say to display the British pound sign or something like that, it will also be removed, that is the price you will pay since I can't really determine exactly what Quicken Windows will or will not accept outside of the normal printable characters. After all the non printable characters are removed the follow window will come up, please note it can take a while to get through cleaning up the data, and caching it in memory. It gets the first 5 dates in your QIF file so you you can see what the format in the QIF looks like. The line always starts with D.
In the above example these are from Quicken Windows, and the year is 2008 expressed like '08 that is the format after the year Quicken Windows expects (or 2008 works too). I'm guessing Quicken for Mac doesn't use this format and every date is MM/DD/YY. Well to Quicken Windows a date MM/DD/YY is for the year 19YY, and to make it 20YY it should have been in MM/DD'YY format. CleanQIF will clean this up by adding 2000 to any year less then 70 and 1900 for any date from 70 to 99 it will add 1900, make all dates 4 digits so the Y2K problem is not there. It is also possible your dates are not in M/D/Y format, maybe M/D/Y or Y/M/D. You can select the other formats, and when you select the Clean button CleanQIF will flip them around so that they are right. Quicken Windows US always requires MM/DD/YY(YY) format as so that is what CleanQIF will put out.